Albert ross. – Dirty wet dog , boats and sailing. When i started this blog and wrote up my first list of possible blog post themes : several foolscap pages long, i wrote in “Everglades” , not in any sense of talking about that part of the Florida coast but to feature the amazing everglades challenge and the blokes/blokettes that take on the challenge. Further on i will post a link or two, not just to the organisers website but at least one of the films made by participants during the event. The short version is that the challenge is by way of a 300 mile passage between 2 points on the everglades coast, it can be sailed or paddled ‘offshore’ and/or through the intracoastal passage which is worth a look at in its own right. From memory there are 6 classes from seagoing canoes and sea-kayaks, through sailing dinghies and dayboats and up to small multihulls : the main caveat is that they have to be launched straight off the beach at the start and only by their own crews. I got really excited about this event a few years back and started a serious project to prepare a boat, ship it out there, find a crew and go out there and complete the challenge. I got as far as finding a potential project boat here on ebay, bought the boat and got it home and did a lot of work : at first stripping it down of its old inshore racing gubbins , making new structural parts such as new bulkheads and deck knees, planned the rig out (lug) and was all set to have an intensive work period to get the hull turned around. What happened is that the further back i went into the build the more problems i found and after a few days realised that i had bought a pup and that she was beyond economic repair and so broke her up and gave the trailer away to a mate. The plan was good , the boat was just about the longest hull that i could get (hull speed) that it and its new mast would go in a 20 foot container for shipping out to port everglades, it would be potentially a fast boat (it was a failed olympic design) and the rebuild would have allowed one person to drive the boat while the other one could get some sleep. Part of the training plan was to finish the rebuild , do sailing and tuning trials and then do a fast passage of the entire Uk south coast in the same style as the challenge is sailed. 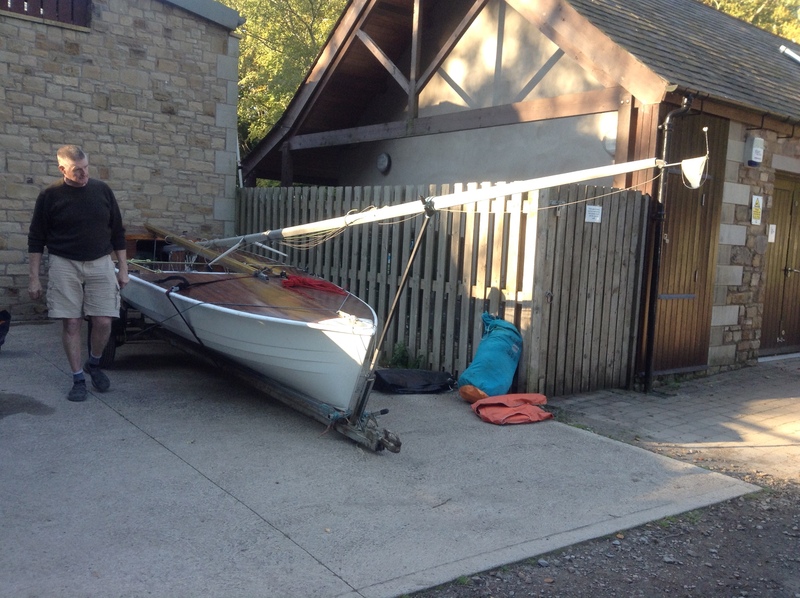 I had in mind a dinghy sailing instructor who had helped me in fitness training as a very capable crew…almost certainly a better dinghy sailor than i am and until the state of the hull became obvious it all looked ‘good to go’. By odd coincidence i have just been finishing a post which includes a link to Andy Seedhouse’s boat brokerage so of course while i was there i had a nose around to see if i could find a ‘thousand-pounder’ project to go with the post. I didn’t but what should be there but a GRP hulled Osprey project for a fiver under £400. Now its a long drive over to Woodbridge and i am casting around for other excuses to make a trip but i am severely tempted to have a punt at this one. Just a personal note here : i have made it a rule not to include other peoples content just to pad-out my own, i of course don’t have any pictures of the EC myself so you will have to go and search but here are some useful links. Hello,I log on to your blogs named “Albert ross. – Dirty wet dog , boats and sailing.” like every week.Your humoristic style is witty, keep it up! And you can look our website about تحميل اغانى.